“How much?” I asked the stall guy. “Rs 20 only,” he replied. Anyway, Jodhpur is famous for its heritage and forts. 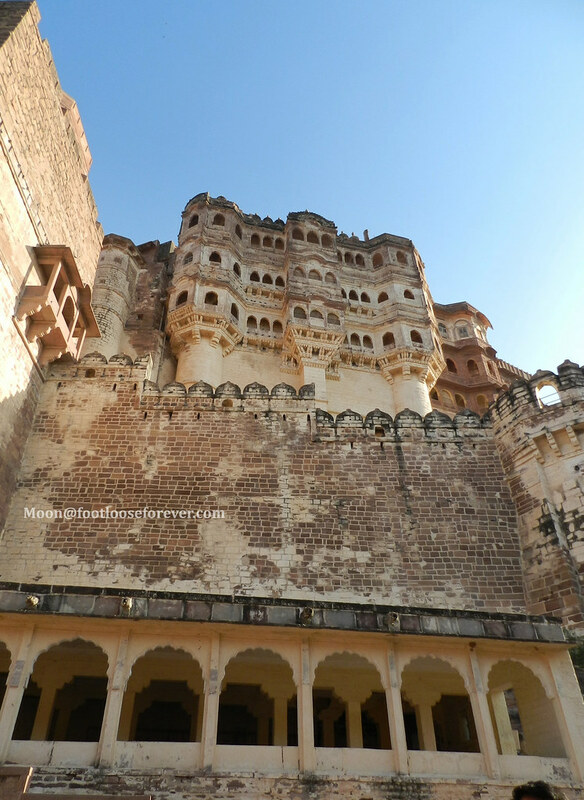 You might have heard about the famous Mehrangarh Fort of Jodhpur. If you have not, all you have to do is to read this article about more than 25 places to visit in Jodhpur. Other than forts, Jodhpur food is famous. Ker-Sangari Sabji is one of those famous vegetable dishes. 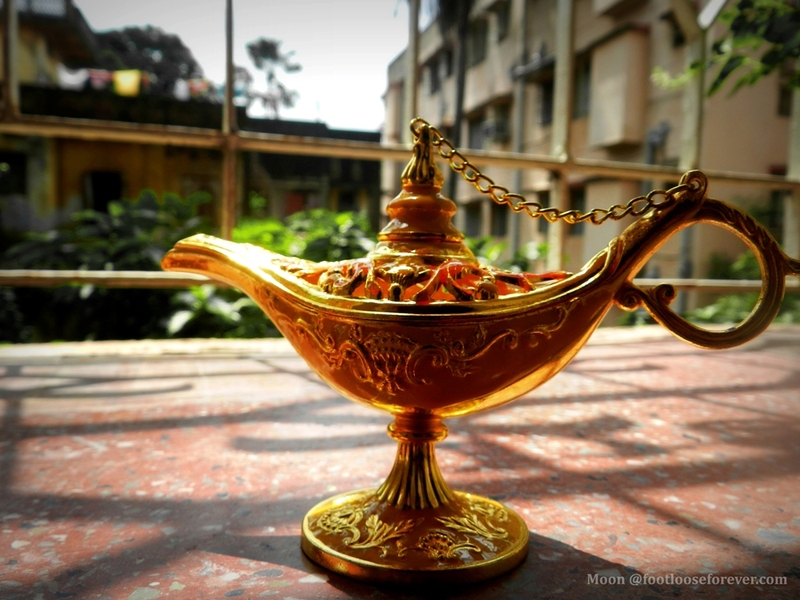 In this article, I will talk about the places to eat in Jodhpur when you are on a budget. This is a topic that will help travelers. I will give exact details so that you will know what might cost at a specific food store. It is a group of small stalls serving Dosa, chow mein, sandwich, Pav Bhaji, pizza, burger, Idli and Sambhar Vada. Near to Ramdev Dosa Corner are two stalls of sugarcane juice (Ganne ka Juice), one shop of ice cream and cold drinks and Mahalaxmi Sweet Corner. Sugarcane juice costs Rs 10 and Rs 20 for small and large glasses. Ice cream price starts from Rs 10. It depends on the type of ice cream you choose. Cold drink rates are MRP rates. Talking about sweets, Mahalaxmi Sweet Corner has various types of sweets and Namkeen (salty snacks). Namkeen cost between Rs 15 and Rs 20. A variety of sweets is offered at different prices. Overall, if you have Rs 200 in your pocket, you can feed your appetite with everything you want. This is also a group of small stalls. Being on C-Road of Sardarpura, there are always ten to twenty people enjoying their food here. Rakesh Dosa Corner serves Dosa, Sambhar Idli , and Sambhar Vada. Sambhar Vada of Rakesh Dosa Corner was what I was talking about at the start of this post. The food items here cost between Rs 20 and Rs 30. By the way, Sambhar Vada costs Rs 20 only. There is Baba Ramdev Soda stall in this group. He serves soda of different flavors. The price ranges Rs 15-20 per glass, depending on the flavor. Then, there is Prabhu Chaat Bhandar. Chaat costs Rs 20. It is tasty. First is ‘Chamunda Ma Ajmer ki Kadhi Kachori’. It costs Rs 20 a plate. In front of Rakesh Dosa Corner (on the other side of the road), there is a coconut juice stall that serves juice of fresh green coconuts. Coconut juice is refreshing in the hot weather of Rajasthan. It costs Rs 30 for one coconut. So, if you have Rs 150, you are good to go. Most of the time you won’t be able to eat more than four items here. It is very cheap considering the expensive hotels where a single dish costs minimum Rs 150. No, it is not the name of the shop. It is a circle with a park. 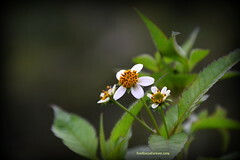 Located at the center of Shastri Nagar, the park attracts people. So here you will find a variety of food stalls. You can also visit the park. The entry fee is Rs 5 per person. Entry is free on every Tuesday. So, here are some shops that you could try. Shree Sai Juice Corner, Bharat Dairy (Amul + Vadilal Ice Creams), Aunty’s Pizza Restaurant, Tea & Coffee Shops, Shree Arora Namkeen, Ashok Chaat Bhandar, Royal Restaurant & Fast Food, Vada Pav, Gol Gappa (Pani Puri) and so on. Depending on your choice of food, it may cost Rs 300 per person here. Since you’ll have a lot of choices, you won’t be able to taste everything at once. I know because I have tried, but after 4-5 items, I always get full and couldn’t eat further. It is a good shop, which I found recently. It is right in front of JNVU Old Campus. It is more of a Namkeen and sweet shop. But what I liked here were Dahi Vada, Kadhi Kachori, and Dahi Palak. It also has a sugarcane juice stall along. Kadhi Kachori costs Rs 20. Dahi Palak and Dahi Vada cost Rs 25 each. Namkeen cost Rs 15-20, and Rs 1 for each bread you take (optional). Sugarcane juice costs Rs 10 per glass. Dal Bati is the signature food of Rajasthan. It is so much popular that there are many shops in Jodhpur that serves only Dal Bati. Bhawani Dal Bati is one of those Dal Bati specialists. They serve tasty Dal Bati and the price is cheap. They serve Dal Bati (many varieties), Desi Ghee, chopped onions, Choorma (sweet), Mirchi Koota, Chatni, and more. The interesting thing about this place is that it looks like basic Dhaba but the Dal Bati tastes awesome. Ghee is on a payable basis. So if you like more you can have more of it. Choorma is also optional. For one person it will cost Rs 100. Since it is a basic Dhaba, you may find it too hot inside during the day. When you eat food items of more than Rs 150 at a street food stall, ask for a discount. Some of the street food items are spicier than restaurant dishes. Sweets are heavy food. Make sure you don’t eat too much. For Dal Bati, remember to drink water before and after eating. For Dal Bati, you might end up ordering more than what you will actually eat. Many of these stalls prepare dishes right in front of you, so you can rely on their freshness and cleanliness. Stomach upset is one of the issues that street food eaters face, so take medical advice if you have that issue. If you wish, you can eat food first and have juice at the end. It is my preferred way. Wash your hands before you eat anything. There you go a list of places to eat in Jodhpur on a budget. It should give you an idea that there is much more to Jodhpur food than expensive restaurants. 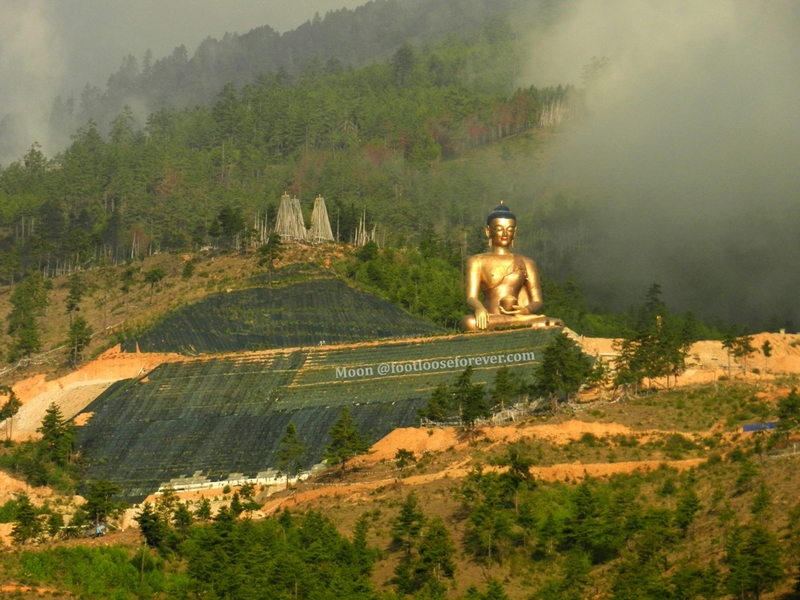 At these places, you will find many locals as well as tourists. You might make friends, go on a city tour together, and they might know some places to chill. 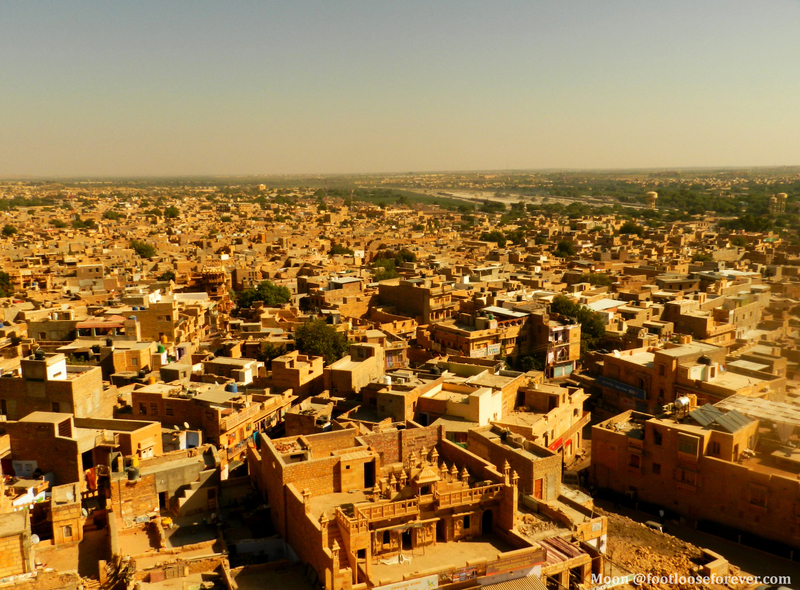 When you have finished your Jodhpur tour, you might head to Jaipur, Jaisalmer or Ajmer. 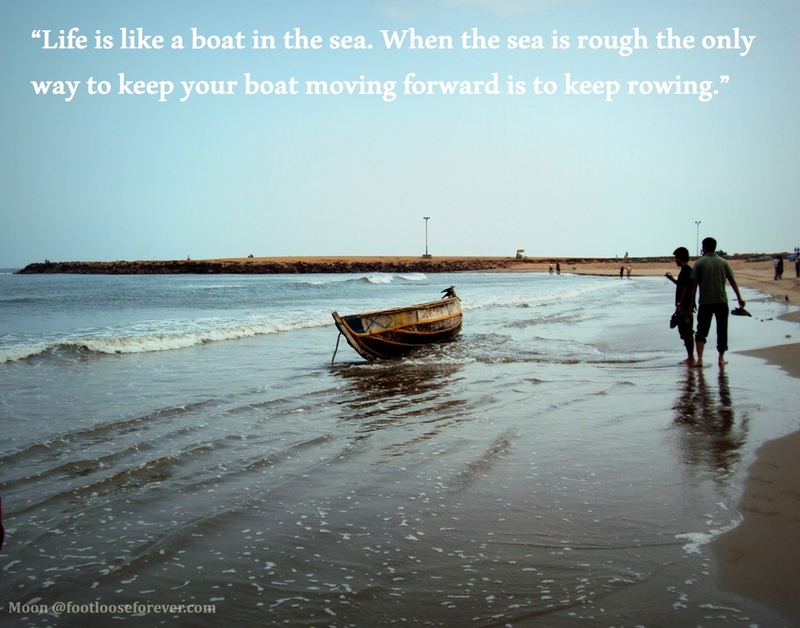 Bookmark this page, so that you find it when you need it. I know this list will amaze you when you actually visit these places. Keep eating! This is an article by Pankaj Solanki, a young guy from Jodhpur. When he is free, he can be seen running and eating street food. Reach him via twitter at @imPankajSolanki. 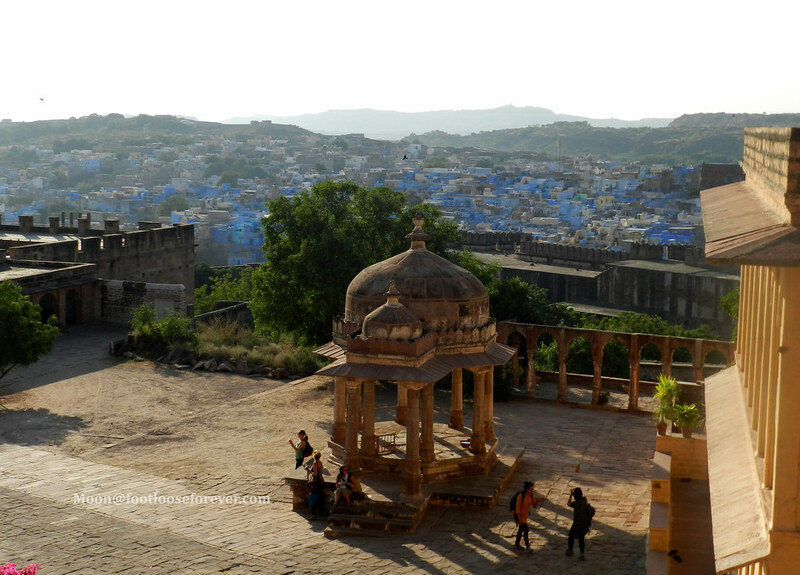 Jodhpur was the last stop in our journey through Rajasthan as per our itinerary – Jaipur – Pushkar (via Ajmer Sharif Dargah) – Udaipur (via Chittorgarh) – Mount Abu (via Haldighati) – Jaisalmer – Jodhpur. We had only one and a half day to explore the place that has so much to offer to its visitors. 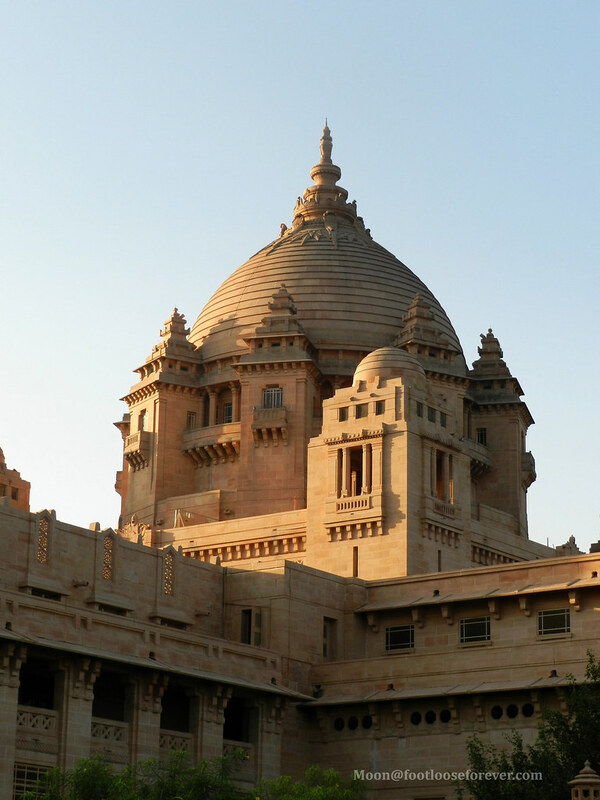 Therefore, we targeted two must-see attractions of Jodhpur – Mehrangarh Fort and Umaid Bhavan Palace. Jodhpur is, perhaps, the best place to witness the royal heritage of Rajputana. While the palaces in Mehrangarh Fort and its in-house museum tell you about the grandeur and glory of the royal Rajputana in the middle ages, Umaid Bhavan Palace presents the kingly aura and a tradition of luxury living that Jodhpur still carries on in modern times. Our first stop was Mehrangarh Fort. 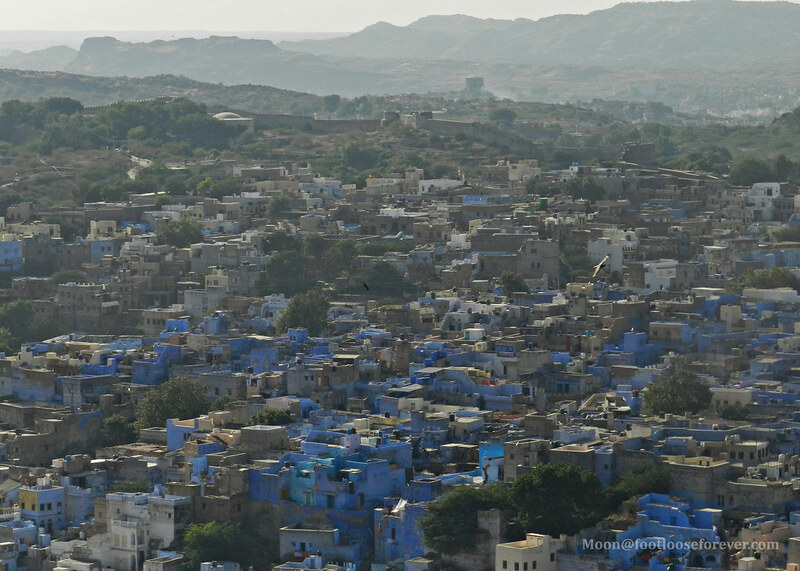 Nestled on a hilltop outside the town the fort overlooks the “blue city” Jodhpur and the rugged landscape of rural Rajasthan. The fort bears the mark of architectural elegance of medieval India. Its palaces, windows, pillars, corridors, and halls, everything has a story to tell. 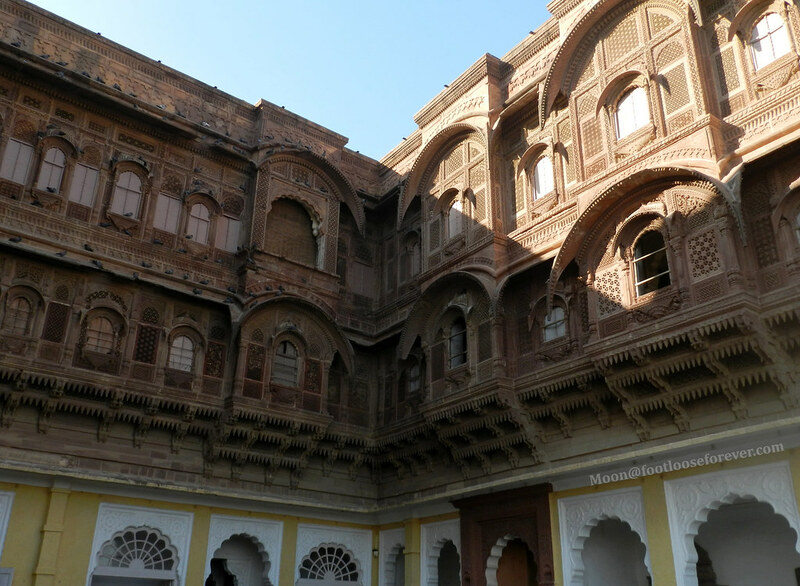 I listened to the little facts and anecdotes about the royal Rajput lifestyle and culture that our guide shared with us while exploring the fort and its heritage museum. The museum exhibits the weapons, armours and accessories used in battle at that time. Fine robes, jewellery, decorative items, and golden palanquins used in carrying kings and queens, are also on display in the museum. I came to know that straight swords belonged to the Hindu Rajput warriors while Muslim fighters used curved swords in battle. While we were passing by Maharaja Takat Singh’s mahal, a colourful chamber decorated with stained glass and golden embellishments on pillars and walls, our guide told us an interesting story about the king and his private life, which I would like to share here. On the contrary, the life of queens and princesses in the palace where sunshine barely entered, were not so colourful. I heard that the daily activities and entertainment of women in royal families were mostly restricted within the palace and areas meant for them. Our next destination was Umaid Bhawan Palace. The palace, built in 1943 and currently the “world’s largest private residence,” is a wonderful instance of neoclassical architecture with excellent blending of eastern and western styles. The iconic architecture, named after Maharaja Umaid Singh, is partially open for visitors. 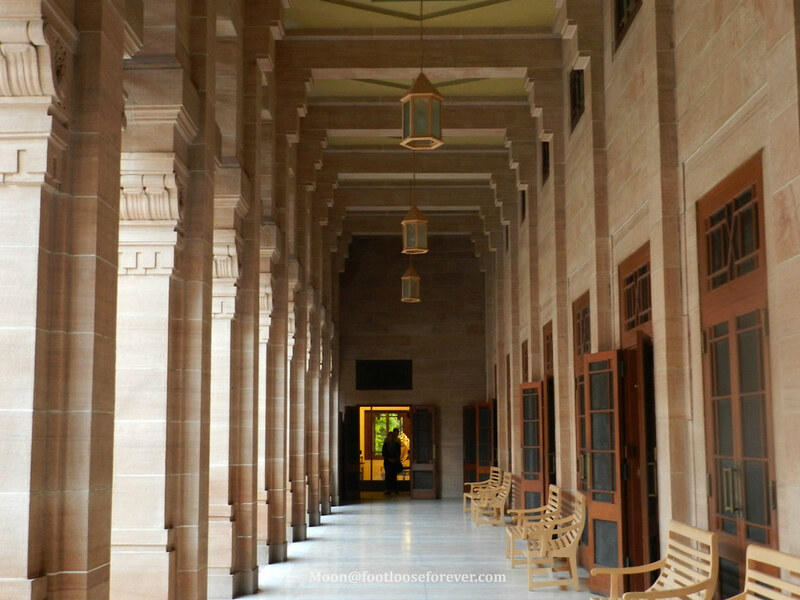 Compared to Mehrangarh Fort palace and other old palaces in Rajasthan, Umaid Bhawan Palace is more spacious, airy and glamorous with contemporary luxury decor. A small portion of the palace houses a museum where the entire family line of Maharaja Umaid Singh is depicted with portraits of the royal family members. 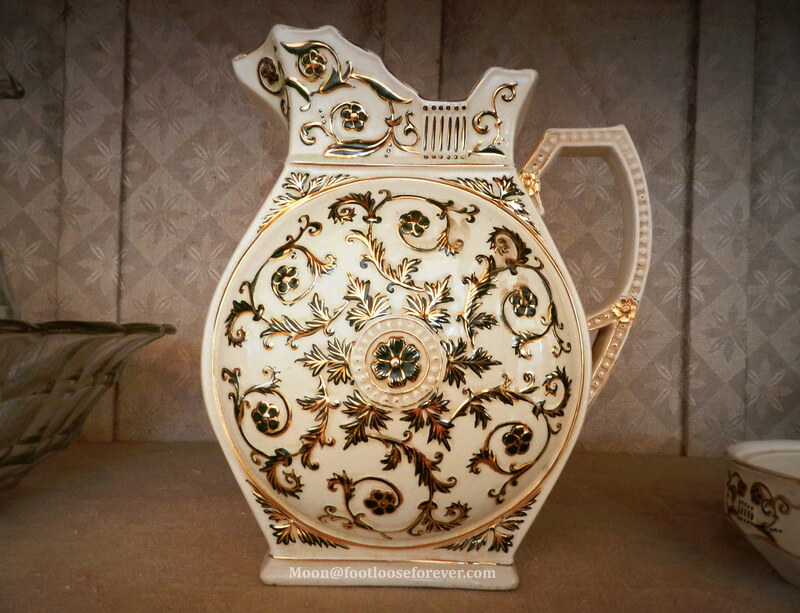 It also displays an exclusive collection of precious artefacts, crockery, porcelain vases, and expensive clocks owned by the royal family. The vivid frescos depict the events of royal coronations. 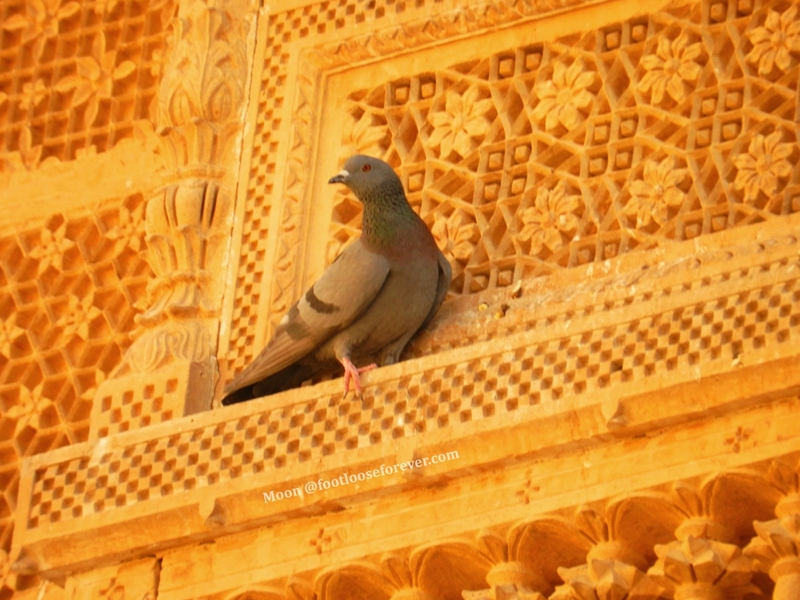 Check out my post – The Colours of Rajasthan for more on Rajasthan travel. After a wonderful day in Mount Abu our next destination was Jaisalmer as per our itinerary – Jaipur – Pushkar (via Ajmer Sharif Dargah) – Udaipur (via Chittorgarh) – Mount Abu (via Haldighati) – Jaisalmer – Jodhpur. I was well acquainted with the name Jaisalmer and some of its characteristics since childhood just like every other Bengali kid who has seen the movie Sonar Kella by Satyajit Ray at least once in their schooldays. 🙂 Scenes like Feluda and company chasing a train through the desert mounted on camels or the little boy Mukul searching for his home of the past life inside the fort are unforgettable. Anyway, it was a tiring 10-hour long bus journey through the scorching desert land. We reached Hotel Sudarshan, a budget hotel with room rates ranging from Rs 300 to Rs 700, at around 7 pm. The rooms were small but appointed with all the necessary furniture. There was a spacious marbled bathroom with hot and cold water supply. The most notable thing about Hotel Sudarshan is it’s traditionally designed interior and exterior. Jaisalmer Fort was clearly visible from the hotel’s rooftop dining hall. Rajasthan is a large province and a versatile place with its exotic landscapes, rich cultural heritage and a plethora of remarkable architecture spread across its various cities and towns. 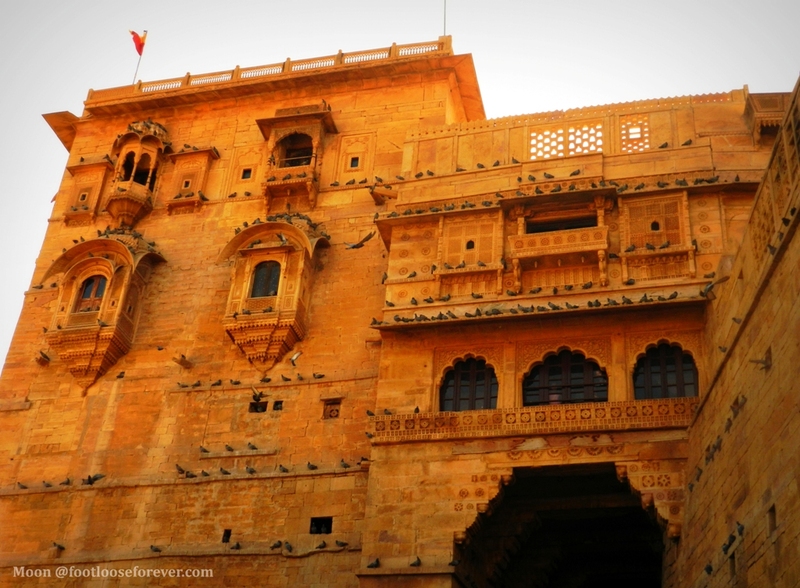 If you want to experience Rajasthan beyond its royal legacy Jaisalmer is the place to visit. Jaisalmer Fort is the oldest living fortified town in India. Today it is the main attraction of the place. The fort is now popularly called Sonar Kella or Golden Fort after Satyajit Ray’s movie Sonar Kella which was mostly shot in Jaisalmer. Our guide Mr Raju Sharma said Jaisalmer Fort was popularized because of Ray’s movie the story of which revolves around this fort mentioned as “sonar kella” several times in the movie. When we reached the main gate of the fort its gleaming sandstone exterior turned golden yellow under the glaring desert sun. Established in 1156 AD by the Rajput king Rawal Jaisal on top of Trikuta Hill Jaisalmer Fort is now a UNESCO World Heritage Site. The fort is dotted with a number of temples and mansions (called haveli in vernacular). We started the walking tour with the Jain temple decked in intricate stone detailing on exterior walls and columns. Inside you’ll see the statues of sacred Jain preachers (tirthankar) including the last and most well known Mahavira. The interior artwork is equally beautiful and reminded me of Dilwara Temple in Mount Abu. We wandered along the zigzag lanes of the fortified town, visited some of the merchant havelis and Sonar Kella movie shooting spot, bargained at a craft shop and not to mention took a lot of photographs. Some portions of the fort are in dilapidated state while some buildings and structures stood the test of time. While we made our way to the main gate of the fort we came across this narrow alley which reminded me of Varanasi, the oldest living city in India. 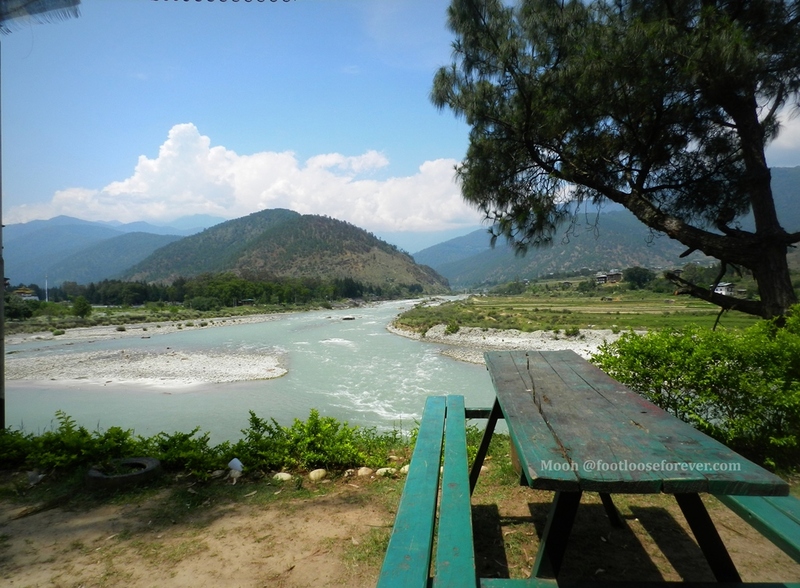 Gadisar Lake is another must see in the fort premise. The lake was created to store rainwater. 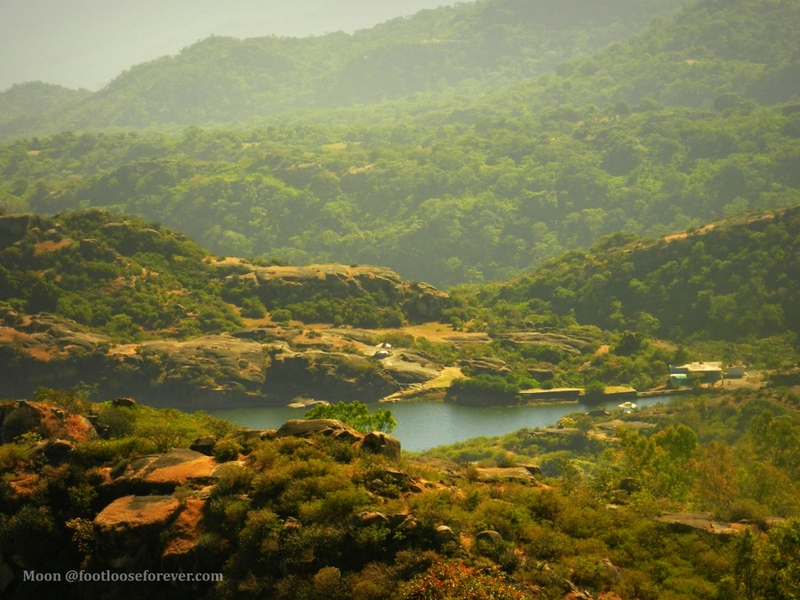 Our guide said it is one of the largest manmade lakes in Rajasthan. 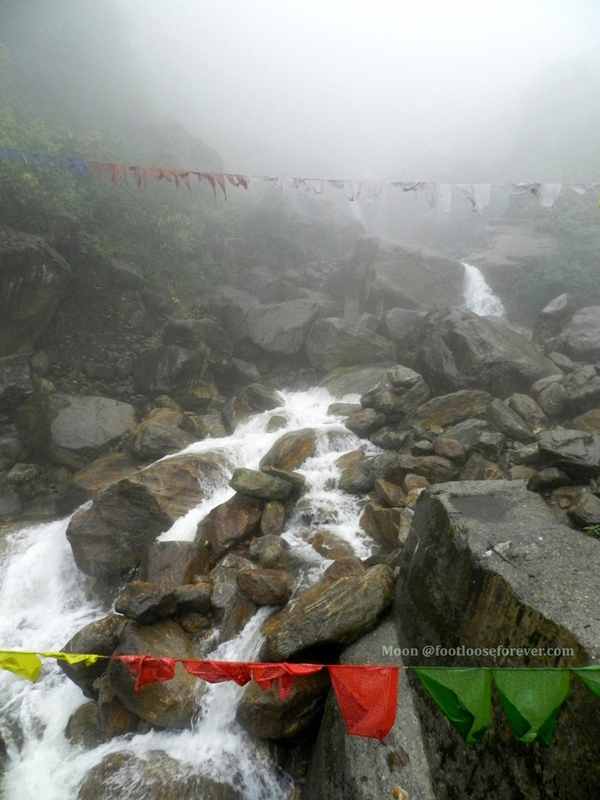 Note: The guides charge to show the lake, temple and fort was Rs 400 for our group of 28 people. 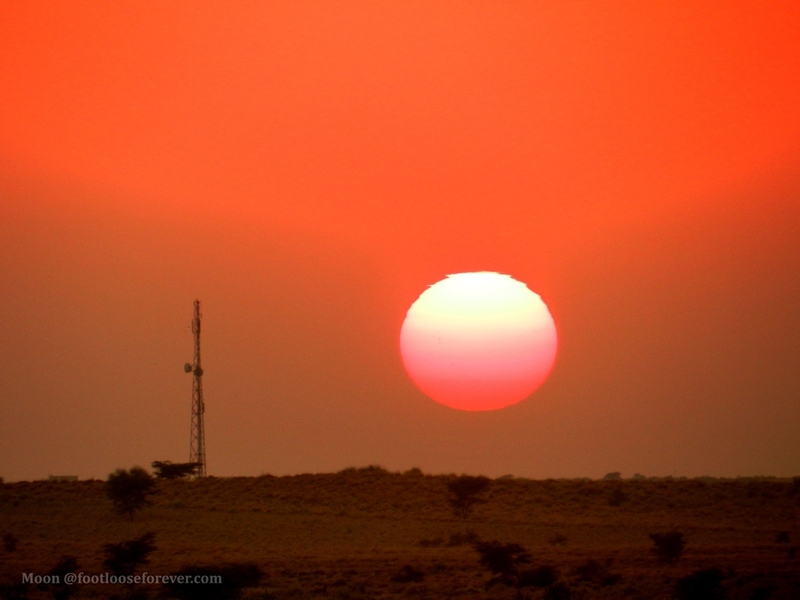 The evening was reserved for the most coveted as well as exciting event – camel ride and sunset watch in Thar Desert. Next was an enthralling folk dance performance at Oasis Camp Resort. From dancing on a small metal platter while carrying 6-7 earthen pots stacked on top of their heads to walking on burning camphor the dancers did it all with their extraordinary skills. The entire show was mind blowing! I returned to hotel in complete contentment that night. 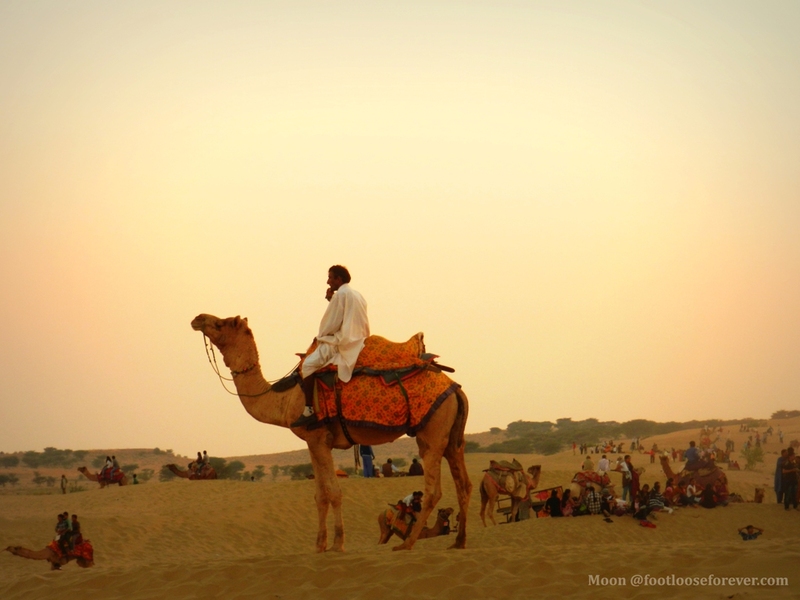 Note: The total cost of camel ride at the desert and folk music show was Rs 330 per person. The entire arrangement was done by our hotel’s travel desk. The dialogue from a popular Bollywood movie of the 80s, Qayamat Se Qayamat Tak, was resonating in my ear as our bus was approaching to the hills of Mount Abu. It was the place where some scenes of QSQT, including my favourite number “Gazab ka hai din...” was picturized. While our bus was running up the hills I was expecting a “gazab ka din” (meaning “an extraordinary day” in Hindi) in Mount Abu. 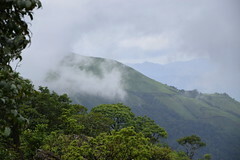 As the height increased the air got cooler and the plantations along the slopes of the hills thickened. 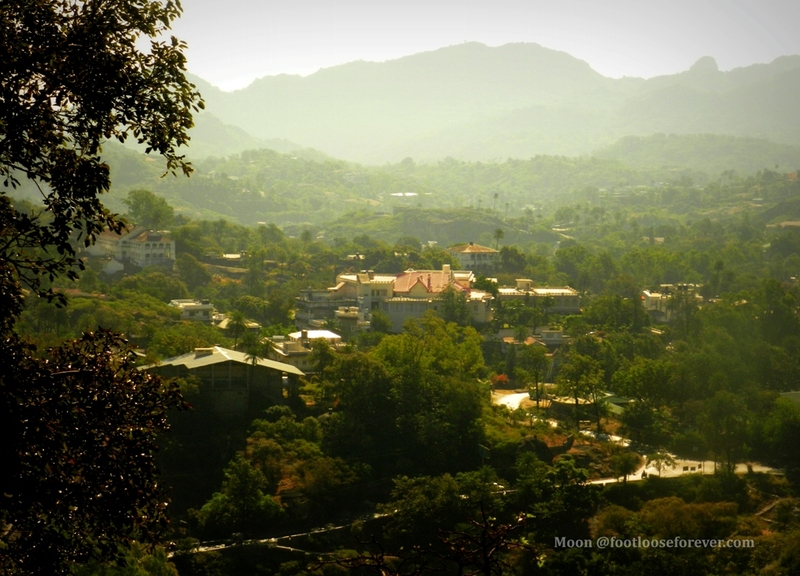 Ah…finally, I am in Mount Abu! We stayed at Hotel Abhishek Palace, a budget hotel with standard accommodation (room rate was Rs 800/-) It was an okay type of hotel which is about 10 minutes walk from Mount Abu’s bustling heart, Nakki Lake. 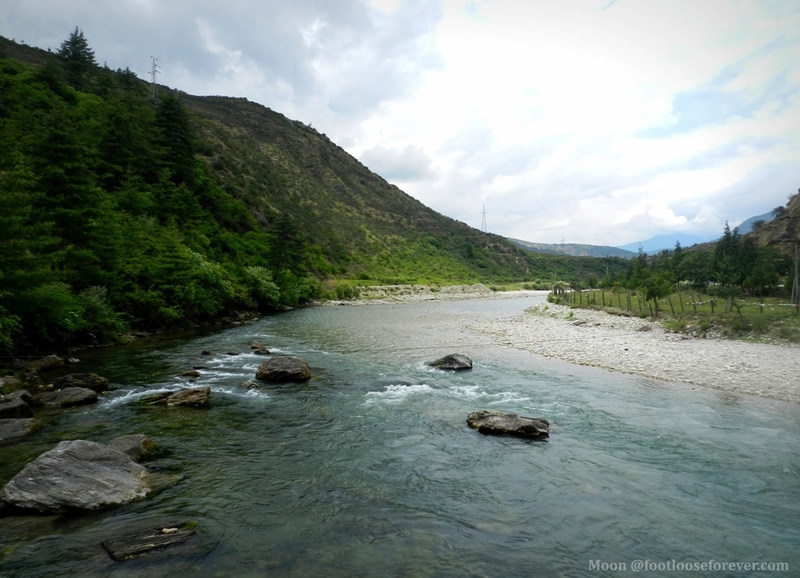 Nakki Lake is a natural rainwater lake. The myth about the creation of this lake goes like this. 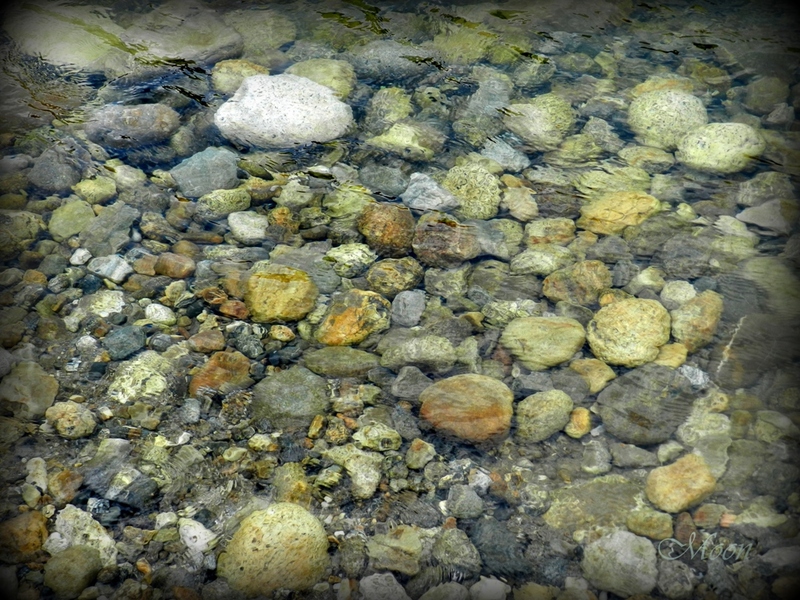 Lord Bramha (of Hindu mythology) dug this lake with his nails. 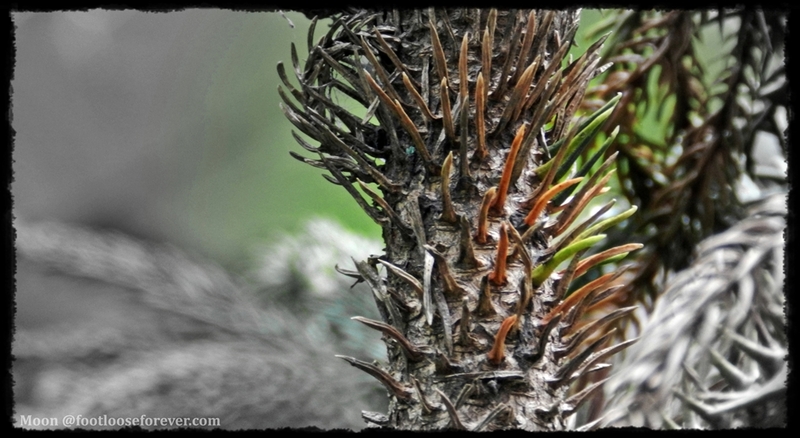 Nail is “nakhun” in Hindi and “nakki” in local dialect, hence the name. 🙂 With food stalls, eateries, cafes and clothing and handicrafts shops all around the decorated garden and entrance to the boat pier this is place to feel the pulses of Rajasthan’s lively hill station, Mt Abu. From dining to shopping to magic tricks performed by young boys – you’ll have many things to do and enjoy at Nakki Lake. Next morning started our Mount Abu Sightseeing. Our first stopover was Om Shanti Bhawan which has a huge assembly hall called the Universal Peace Hall. The institution providing meditation facility was established in 1983 with an objective of educating and enlightening people about peace, spirituality and Paramatma (meaning ‘the Almighty’ in Sanskrit). 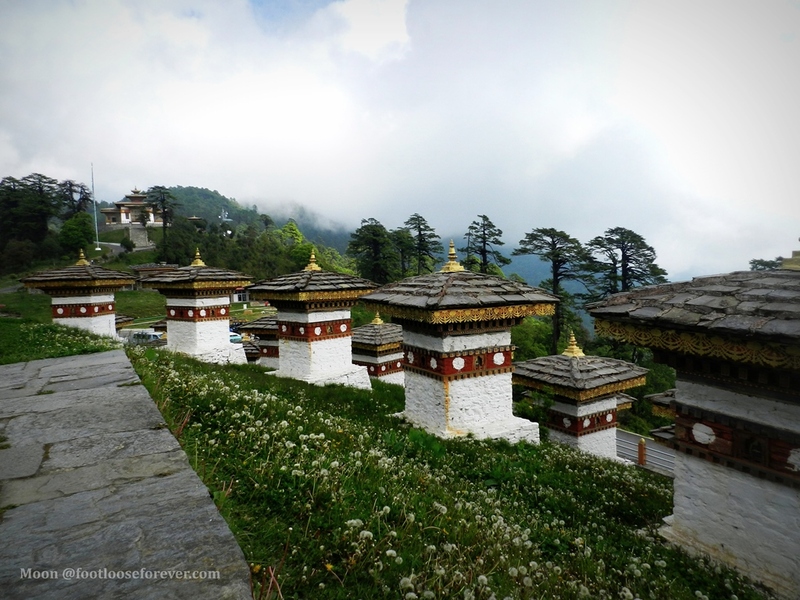 Adhar Devi Temple – The temple is situated on top of a hill and you need to climb 365 steps to reach there. It was a hard but rewarding task as the view from top is very nice. The temple is built along a natural cave has unique structural feature inside. Dilwara Temple – This is the brightest jewel on the crown of Mount Abu. This Jain temple is famous for its stunning and exquisite marble carvings all over the interior walls, columns and ceilings. Unfortunately, the temple authority does not allow camera inside. Charges for camera and mobile deposit was Rs 50/- per person. Achalgarh Fort – The ancient fort town of Achalgarh was not originally had the present name. It was initially built by the Paramara Dynasty in the early medieval period. Later it was renovated by Rana Kumbha but most of the structures are in dilapidated condition. 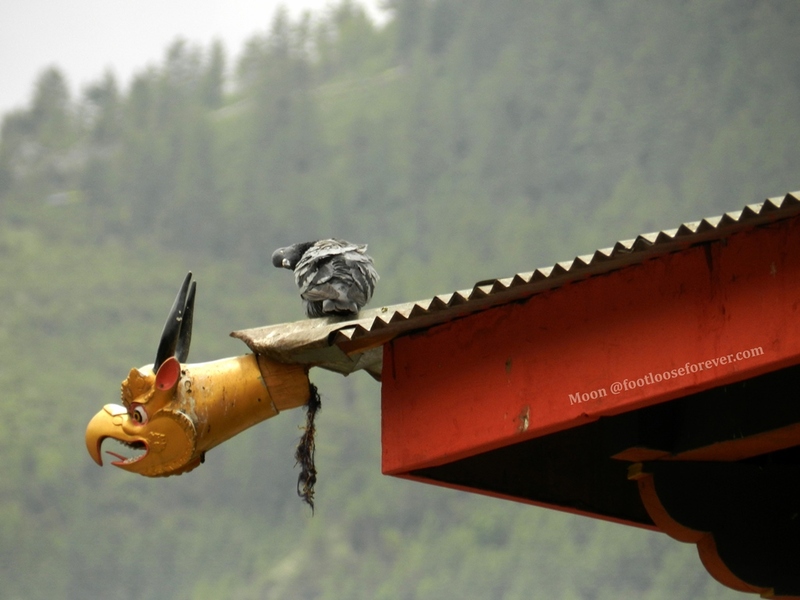 There is a temple of Lord Shiva known as Achaleshwar Mahadeva temple where devotees still offer worship regularly. The taxis (jeeps) to Achalgarh are available from the stand near Dilwara Temple. Each taxi carries 6-8 passengers and fare is Rs 800. The same taxi will also take you to Guru Shikhar, the highest point of Aravalli Range. The peak is about 5600 ft from the sea level. 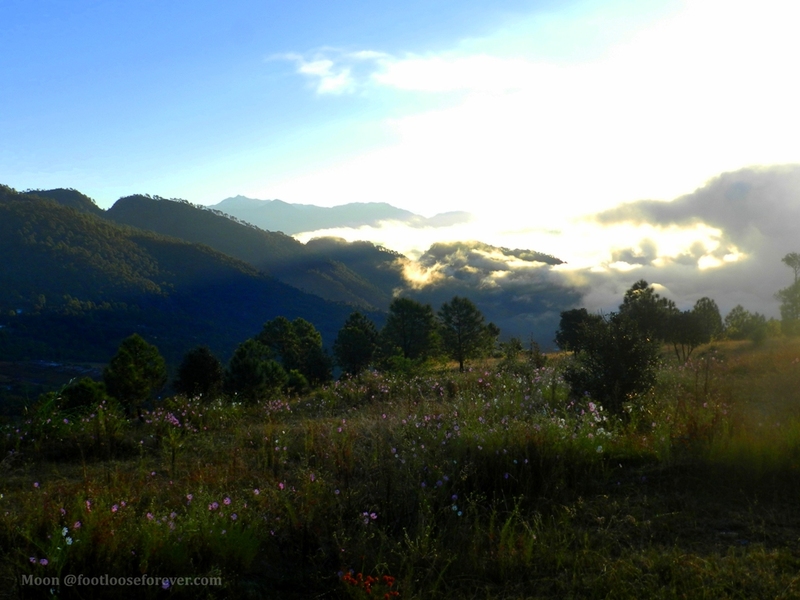 The journey to Achalgarh and Guru Shikhar was remarkable and so was the view from Guru Shikhar. After a daylong sightseeing in Mt Abu we returned to our hotel for lunch. Post lunch session was most memorable because of sunset viewing from the Mt Abu Sunset Point. We reached early, before 5 pm, as our tour guide warned us that crowd will start gathering after 5:30 and you may not find a convenient position if you don’t go early. He was correct. When we reached at around 4:45 I merely saw a few couples here and there. I was so absorbed in enjoying the view down the hill I didn’t notice when the place was filled with so many people. To my surprise, the place was jam-packed with sunset viewers after 5:30 pm. By the way, before I stop here is the song for you. Disclaimer: Dilwara Temple and Nakki Lake (day) images are taken from the internet. Udaipur was once the capital of Mewar Rajputana kingdom in southern Rajasthan. King Udai Singh II of Sisodia clan constructed this city in 1559 and shifted his capital from Chittorgarh to Udaipur as he felt the former was vulnerable to enemy attack. He needed a more secure location which he found near Girwa Valley, along the Aravalli Hills. This new capital city of Mewar was named after him. With the beautiful Lake Pichola on the backdrop Udaipur is now a romantic destination dotted with exquisite medieval Rajput architecture. The city is built around huge lakes, namely – Fateh Sagar (‘sagar’ meaning lake in vernacular), Swaroop Sagar, Udai Sagar and Pichola to lend its popular names such as the “City of Lakes” or “Venice of the East”. As I have already mentioned in my previous post that we were destined to Udaipur from Pushkar via Chittorgarh. It was a long, tiring drive under the scorching sun of Rajasthan, even in late November. After a few hours of Rambling in Ruins of Chittorgarh we were headed towards Udaipur. It was almost 9 pm when we reached Hotel Dimple International. From my experience I would suggest everyone to avoid this hotel. The door locks were defective. Inside the room the bed linens and bathroom were dirty. We asked the staffs to change the linens and what we got in exchange were similar dirty stuffs. This was the only hotel where I had such bad experience in my entire Rajasthan tour. Our tour was operated by a travel agency. Should I booked hotels myself I would never choose this hotel based on only two reviews on TripAdvisor. However, there are a number of budget hotels in Udaipur that offer satisfactory service. You’ll get a decent accommodation within Rs 2000. Udaipur is a historical place full of royal palaces and architecture to explore and admire. The lakes and gardens add to its historical charm while offering additional options for tourists to spend quality time there. Sahelin-Ki-Bari (Garden of Maidens), Chetak Smarak (Memorial of Chetak, the famous horse of Rana Pratap, the King of Chittor), Sukhadia Circle and Nehru Island Park are such places in Udaipur. Chetak Smarak is a landscaped garden with a magnificent life-size bronze statue of Rana Pratap astride his horse, Chetak. You must be wondering why they built a memorial for a horse. Well, Chetak was not an ordinary horse. He was a very big, powerful horse. He saved Rana Pratap’s life in the battle of Haldighati. When Mughal army, under the command of Marwar king Man Singh, outnumbered Rana Pratap’s army and Rana Pratap had to retreat a severely wounded Chetak (with one leg chopped off) carried Pratap away to a secure place and breathed his last. Since then he has become a legend. By the way, entry fee to the garden complex was Rs 45. This was my second best experience in Udaipur. First is obviously visiting Udaipur City Palace. 🙂 Boats here are large motorboats where the boatman took a group of 15-20 people at a time. Twenty minutes boat ride in Lake Fateh Sagar cost Rs 100 per person. 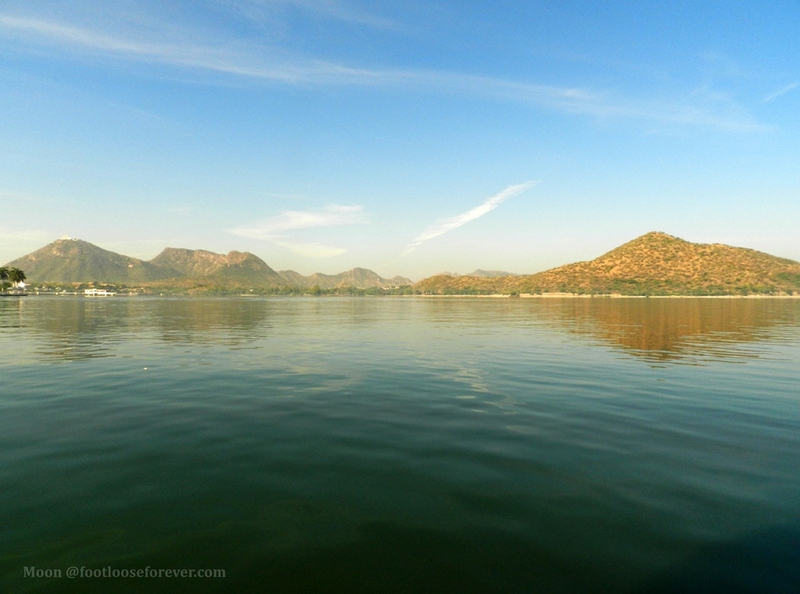 You can also enjoy a royal boat cruise to Udaipur Lake Palace in Lake Pichola. Sahelin-ki-Bari or the Garden of Maidens is a beautifully decked garden with lush plantation, lotus pools, fountains and canopy of trees. The guide told us that the garden was created for the princess (the daughter of Maharana Sangram Singh) as she wanted a cool place to spend summer with her maiden attendants (‘saheli’ in local language), hence the name Sahelin-ki-Bari (‘bari’ refers to ‘place’). The garden complex also houses a museum. Rajasthan and puppetry are inseparable. Stringed puppet dance is an integral part of Rajasthan’s culture since ages. It was one of the popular modes of entertainment in olden days. The traditiona is still alive in rural Rajasthan. In Bharatiya Lok Kala Mandal, a governmental institution of art and culture, you can watch puppet shows and get an idea of Rajasthan’s rich tribal art and crafts. We enjoyed a short 15-20-minute puppet show which was really very amusing. 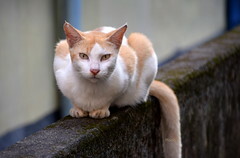 For me this was the most coveted part of our Udaipur sightseeing tour. 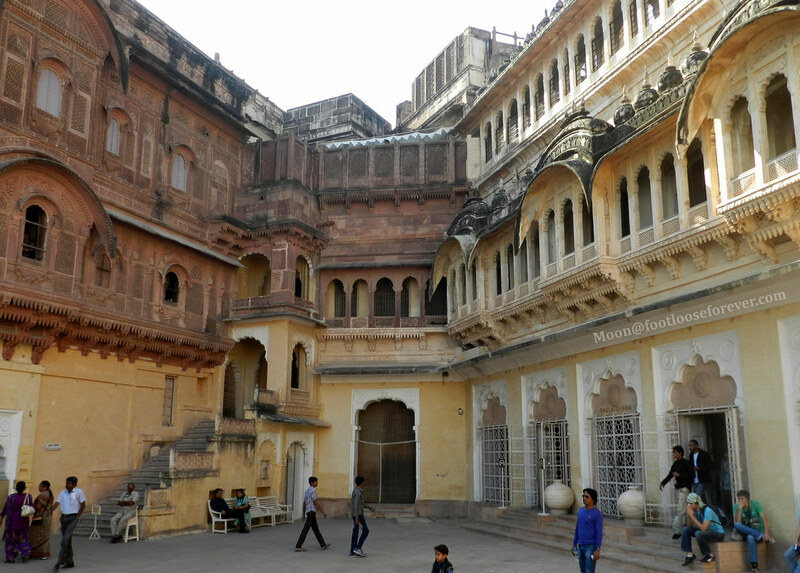 The 400-year-old iconic City Palace was built by King Udai Singh II as his royal residence and administrative office. 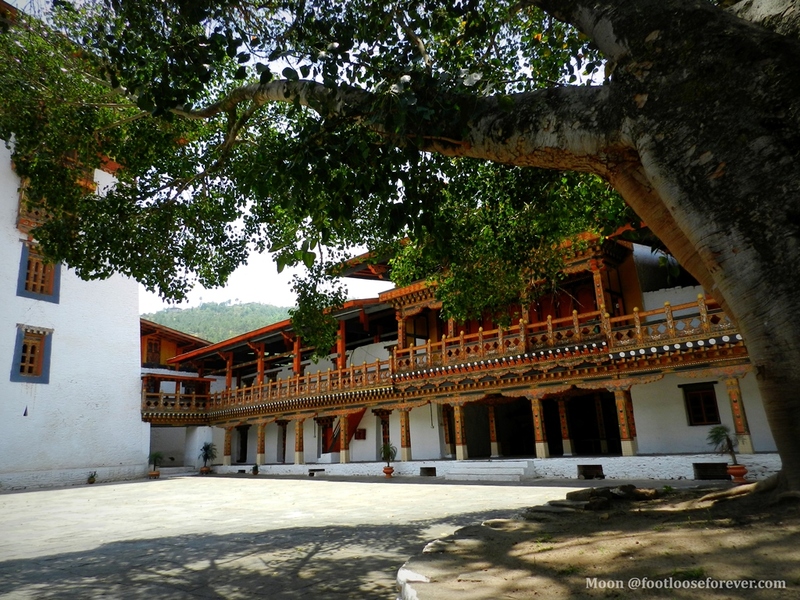 Later his ancestors made addition and extension of the main palace building to give it the present look and volume. 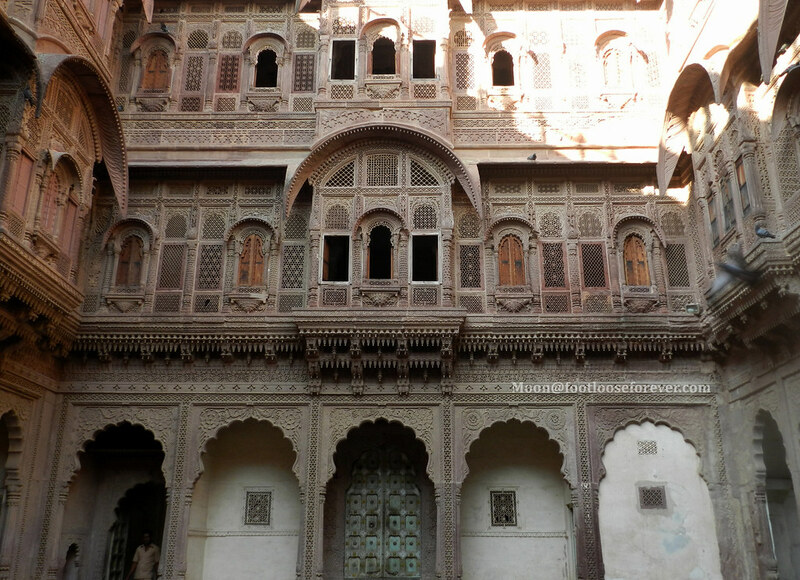 The palace architecture is a combination of Rajput and Mughal styles. The City Palace offers a spectacular panorama of the entire Udaipur city from its porches. 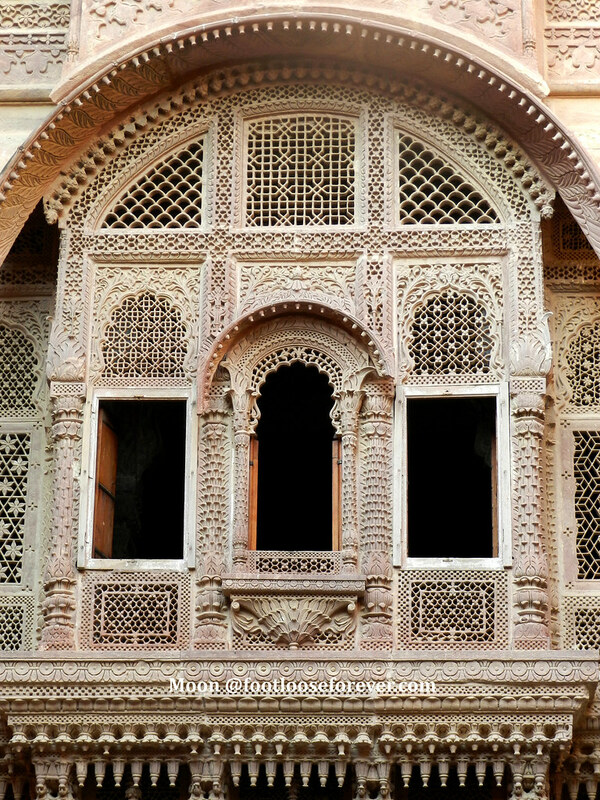 As you step inside, you find a series of glamorous mahals (palatial residences) that are maintained as they were in time of Rajput monarchy. For your information, entry charges to City Palace was Rs 115 per person and Rs 225 for camera (optional). Remember that you need a guide to explore the palace. Guide’s charges for a group of 21-30 people was Rs 350/- in total. Built by Rana Kumbha in the 15th century Kumbhalgarh Fort is one of the six famous ‘Hill Forts of Rajasthan’ and a UNESCO World Heritage Site. This spectacular fort is located 82 km northwest from Udaipur. 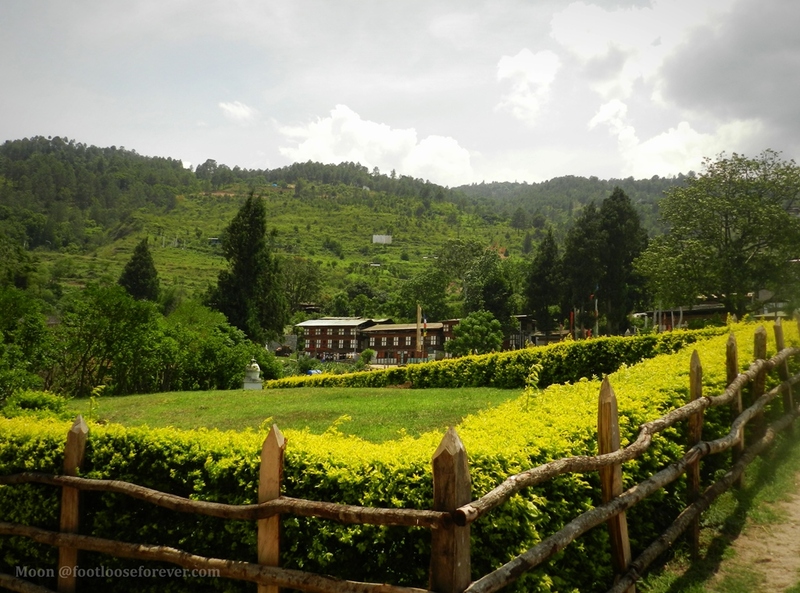 The entire fort perimeter is surrounded by a thick, strong brick wall stretching 36 kilometers along the hills. This is said to be the world’s second longest wall after the Great Wall of China. Sajjan Garh Palace, also called ‘Monsoon Palace’, is a royal residence nestled on top of Aravalli Hills overlooking the Lake Fateh Sagar. Named after its creator Maharana Sajjan Singh this palace was built in 1884 to watch the arrival of monsoon clouds in the region. The place offers breathtaking panoramas of Udaipur’s lakes and neighboring countryside. Well, that’s not all. There are much more to see and experience in a versatile, culturally rich place like Udaipur. On our way back from the City Palace we visited Jagdish Temple, which is located in the vicinity of the palace. I saw several textile and art and crafts shops lined up the streets leading to the City Palace. 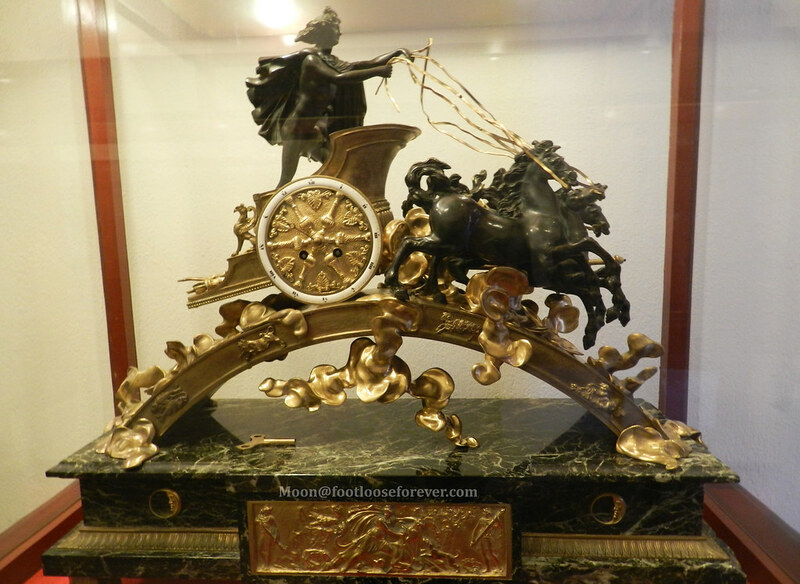 But if you want to but authentic Rajasthani artifacts, especially exclusive jewellery and decorative items made of oxidized metals Rajasthali is the place to go. This is the only handicrafts emporium in Udaipur owned by the Rajasthan Government. After a long, tiring day of sightseeing in Udaipur we came back to hotel. That night I couldn’t sleep well because the next day was meant for a journey to famous Mount Abu via the historic battlefield of Haldighati. Haldighati, only 40 Km from Udaipur, houses a museum where you’ll see large statues of Rana Pratap and Raja Man Singh, right in front of the museum building. Inside, an array of life-size clay models depict the various incidents of the historic battle and chivalry of Rana Pratap, the eldest son of Rana Udai Singh II. The museum also exhibits Rajasthan’s rural life using clay models. So, that’s all about Udaipur from me. While I had seen some of its main attractions many were left behind as we didn’t have enough time. But Rajasthan is a place where I would love to come back again and again and it will never cease to amaze me. 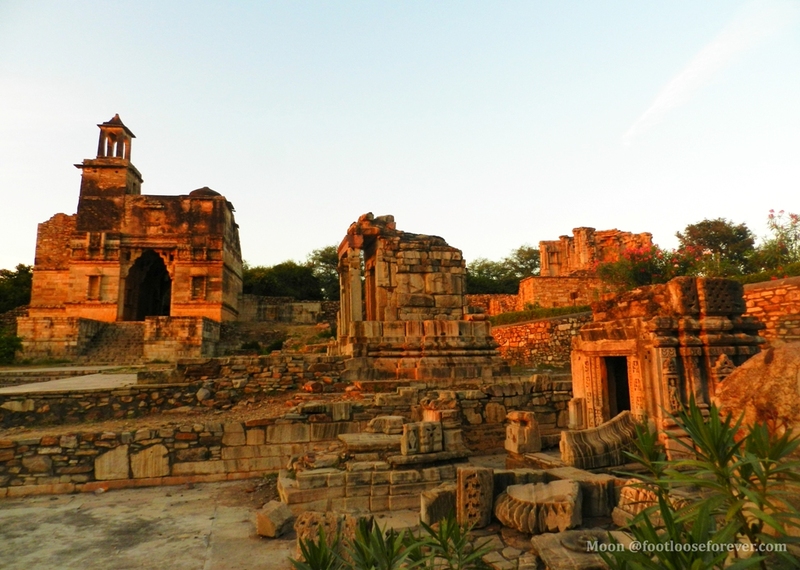 Chittorgarh – the name instantly invokes a mixed feeling of awe, veneration and thrill. The moment I read the name in our itinerary the names like Rana Pratap, Mira Bai, Rani Padmini thronged my mind. 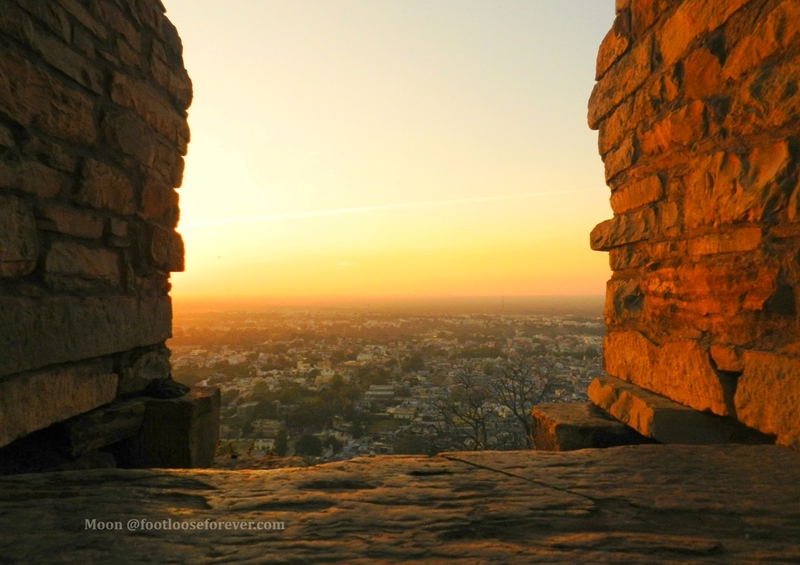 Chittorgarh is a place full of historical sagas of chivalry, sacrifice and spirituality. Our Rajasthan tour plan was like this – Jaipur – Pushkar (via Ajmer Sharif Dargah) – Udaipur (via Chittorgarh) – Mount Abu (via Haldighati) – Jaisalmer – Jodhpur. So we left Pushkar early in the morning and reached Chittor in the afternoon on our way to Udaipur. 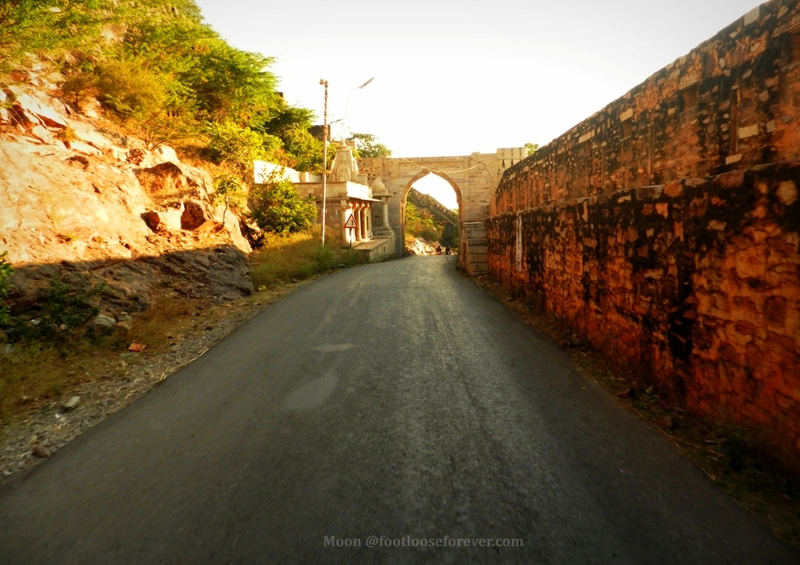 The fort is situated on a hill and you can take a tour of the entire fort area by auto rickshaw. We booked autos from the auto stand near Hotel Padmini. It took Rs. 100 per head. The cost included auto fare and guide’s charge for our group. Chittorgarh was a fortified town in time of Rajput rulers. I assume it took years to build such a huge fortified town which is also the largest fort in India. The guide said there are total 113 temples inside the fort apart from palaces and monuments. Once the capital of Mewar Rajputana (Southern part of Rajasthan) Chittorgarh is now a UNESCO World Heritage Site. It was ruled by Guhilot and Sissodia dynasties from 7th Century AD until captured by Emperor Akbar. Unfortunately, it was already 5 pm and we had too little time to explore the entire fort area. This is one of the downsides of joining conducted tour by travel agencies. Ours was a large group and you know the proverb … too many cooks spoil the broth. 😛 We always fell short of time. Anyway, I roamed around and explored the palaces, memorials and temples as many as I could before the dusk. Surya Mandir or Sun Temple in Chittorgarh is the place where Rajput kings offered worship to sun god. The temple erected in 8th century stood the test of time for over a millennium. The intricate stone detailing on the temple walls and columns is a treat to the eye. This is the temple of Mira Bai. It was built separately beside the sun temple. The Rajput rulers were worshipper of Surya (the sun god). But Mira Bai despite being a Rajput daughter and the queen of Chittor was a devotee of Lord Krishna and later chose the life of a saint. Mira used to sing devotional songs and won people’s love with her soulful singing and sacrifices. This is the temple where Mira Bai contemplated for the last time and nobody had seen her after that. The legend says her mortal body was merged to the icon of Lord Krishna in the temple. We started our Chittorgarh tour with Vijay Stambha (Tower of Victory) which is the emblem of Chittor’s glorious past of valor and heroism in protecting their motherland. The monument was built by Rana Kumbha (1458 AD-1468 AD) to celebrate his victory over the Sultan of Malwa in 1440 AD. The tower has over 150 steps to the top balcony. I bet if you can make it to the top it will be the most rewarding experience to enjoy a 360 degree view of the fort. Queen Padmini’s Palace is situated in the middle of water. The path through the garden entrance led us to the room where Allauddin Khilji is said to have a glance at the reflection of Rani Padmini on a mirror while the queen stood at the gate of her palace. It is said that Padmini the wife of Rana Ratan Singh was so beautiful that the story of her ravishing beauty reached the ear of Nawab Allauddin Khilji and he came all the way from Delhi to Chittor to see her. But it was against the dignity of Hindu Rajputana that an outsider will look at the queen. Again, they didn’t have the choice to refuse Khilji who had a strong army. So they arranged it liked that. Later in 1303 Allauddin attacked Chittor and killed Rana Ratan Singh to possess his queen. But the queen and all other female royals committed suicide by burning to death called Jauhar. This was a custom meant for Rajput female royals. Whenever the kingdom was defeated and captured by the enemy (especially Mughals) they committed Jauhar to avoid the shame and indignity at the hand of enemy. The huge pyre where women jumped into the fire was called Jauhar Kund. The Brahma Temple in Chittorgarh was built by Rana Kumbha to honour his father. The adjoining garden called Charbagh houses the cenotaphs containing the ashes of Chittor’s kings starting from Bappa Rawal to Udai Singh, the founder of Udaipur. Built adjacent to Bramha Temple this reservoir holds water for sacred functions and worship. As the name reveals the shape of the reservoir resembles the mouth of a cow, the sacred animal in Hindu religion. The cascading structure with the reservoir at the bottom creates a wonderful vista. Apart from this there are Rana Kumbha Mahal or the Palace of Rana Kumbha, Kirti Stambh, Fateh Prakash Museum, Naulakha Bhandar or the ‘Nine Lakh Treasury’ established by Rana Kumbha are some of the main attractions of Chittorgarh. 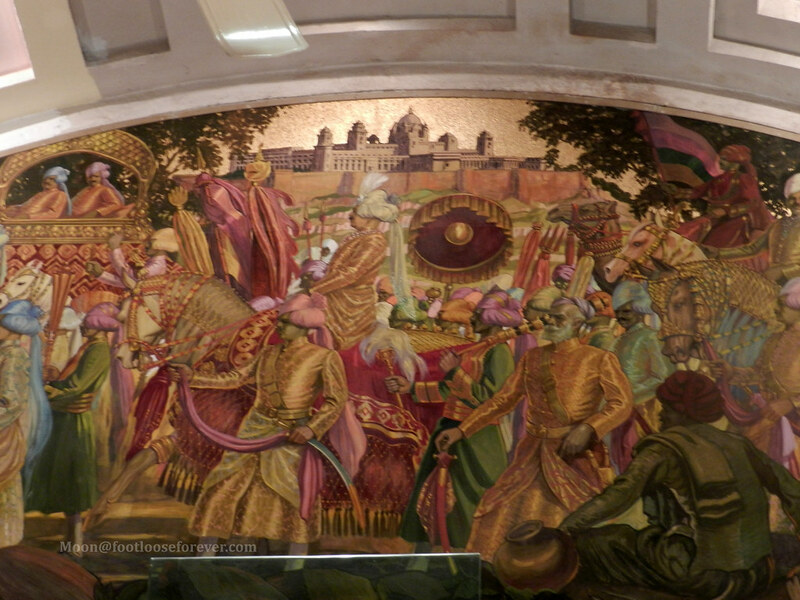 Fateh Prakash Museum opened in the residence of Maharana Fateh Singh, is located near Rana Kumbha Palace. The museum remains open from 10am to 4pm daily except Fridays. After about 2 hours of rambling in the ruins of Chittorgarh it was time for us to leave for Udaipur. 😦 The stone edifices looked mysterious in the dying daylight. I wished I could stay there for some more time. But Udaipur was beckoning. It looked even more beautiful in the light of setting sun. “The camel fair is over. What’s the point of visiting Pushkar at this time?”, I thought, after looking at the itinerary of our Rajasthan Tour. 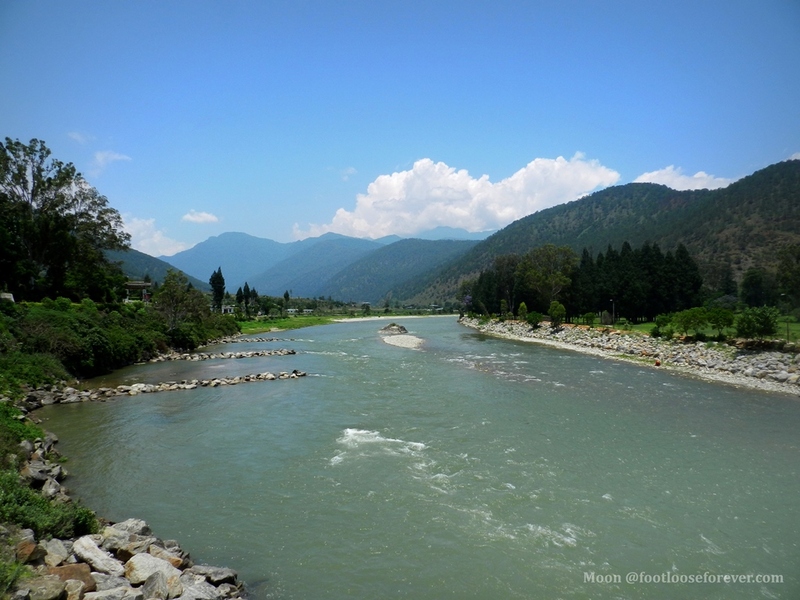 A small town with a few temples and a lake is not a place to attract me – a person who likes to stay away from temples. After a daylong sightseeing in Jaipur we headed for Pushkar the next day. I had no idea what surprise was waiting for me there. We started early in the morning and reached our hotel (Hotel Teerth Palace) in Pushkar at around 3:30 pm. Our 7-hour long drive included only one stop at Ajmer Sharif for a quick visit at the shrine of the sufi saint, Moinuddin Chishti. We also had our lunch break there. Hotel Teerth Palace is a relatively new accommodation located at a quiet corner of the town of Pushkar, away from the crowd. You can read my review of the hotel on TripAdvisor. After dumping our luggage at the hotel we quickly got fresh and set out to explore the religious town, which is also one of the five sacred Hindu pilgrimage sites in India. Even if the famous Camel Fair was way over when we visited in December we found there are more things to do in Pushkar. In a small place like Pushkar a walking tour is the best way to get the vibe of the place. 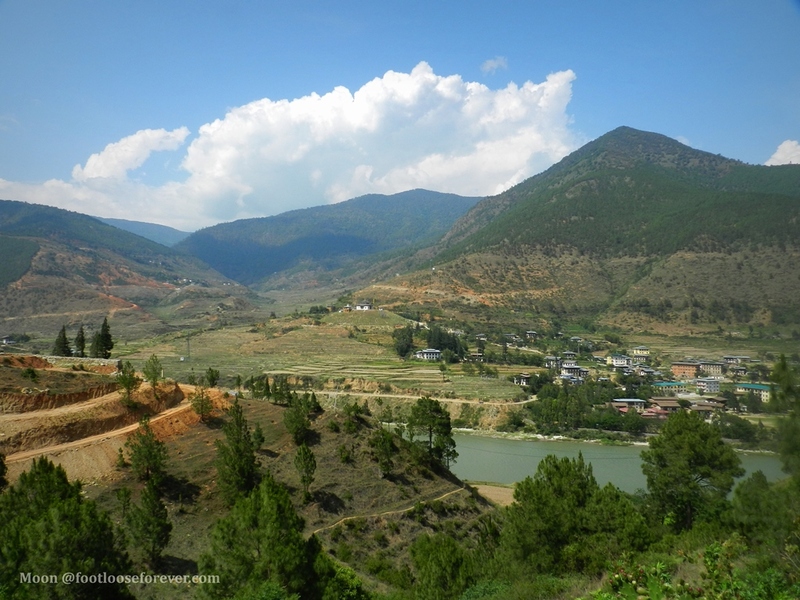 It takes 15-20 minutes’ walk from the hotel to the Holy Lake through a lively market area. 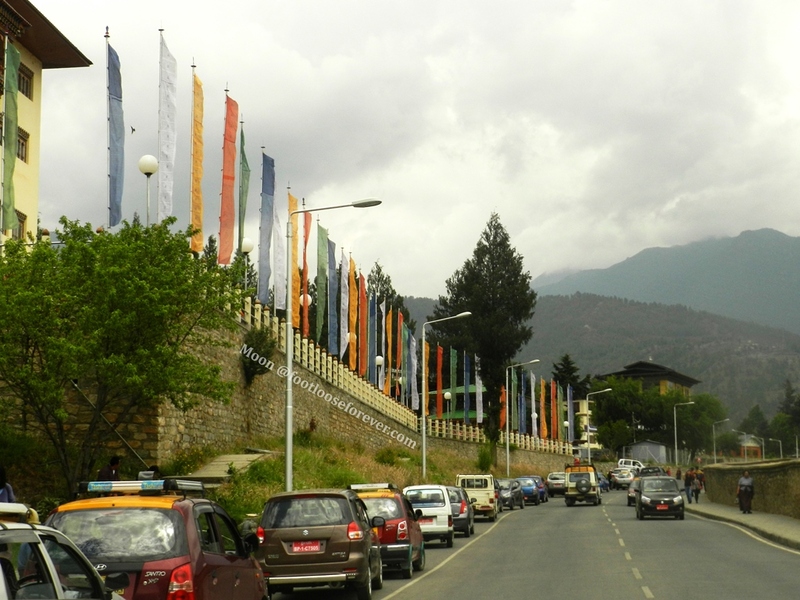 There were textiles and garment shops, handicraft stalls, eateries and miscellaneous stores on both sides of the road that led to the Holy Lake. Looking at the garments and accessories stores all around I figured out that Pushkar would be a good place for shopping. And I was right! We’ll talk about shopping later. 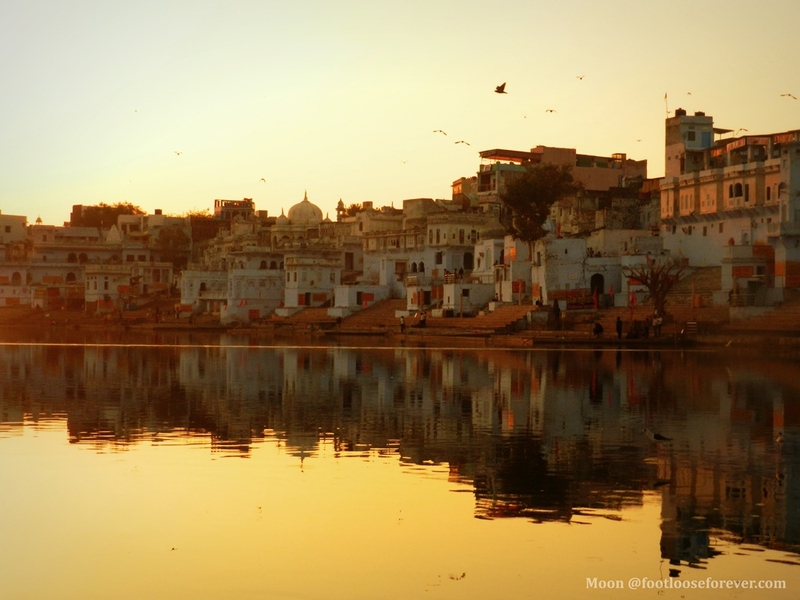 The holy lake is the lifeblood of Pushkar. It is the pulsating heart of this small Rajsthani town. As you step down the stairs of the Ghats you will instantly feel the sanctity of the place, a sense of calm and spirituality. Don’t forget to put your shoes off before you step down to the water. When we finally reached our destination it was 5:30. The sun was approaching the horizon. The temples around the lake were gleaming in the golden streaks of setting sun. Our shadows grew taller. The pigeons flew back to their nests. 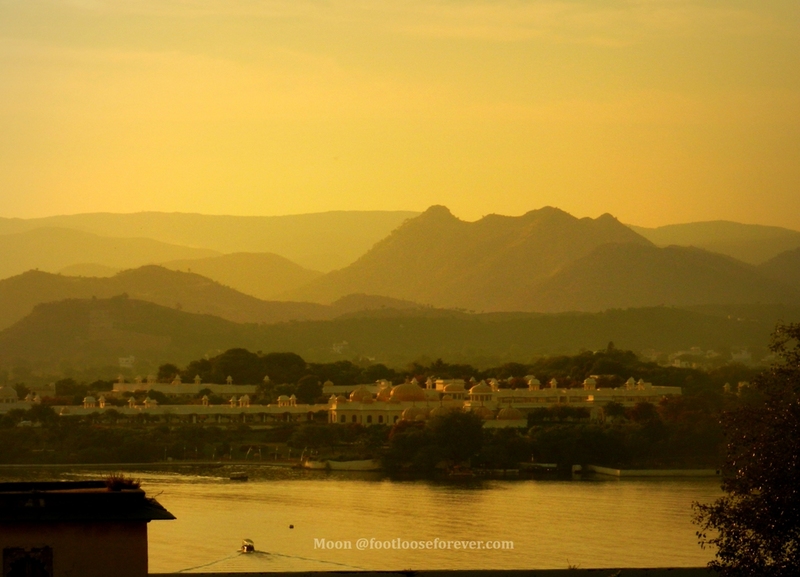 The sunset at Pushkar lake is perhaps the most beautiful one I have experienced in Rajasthan. After enjoying a beautiful sunset at the lake we made our way to Bramha Temple or Jagatpita Brahma Mandir to witness the evening aarti (Hindu way of prayer). 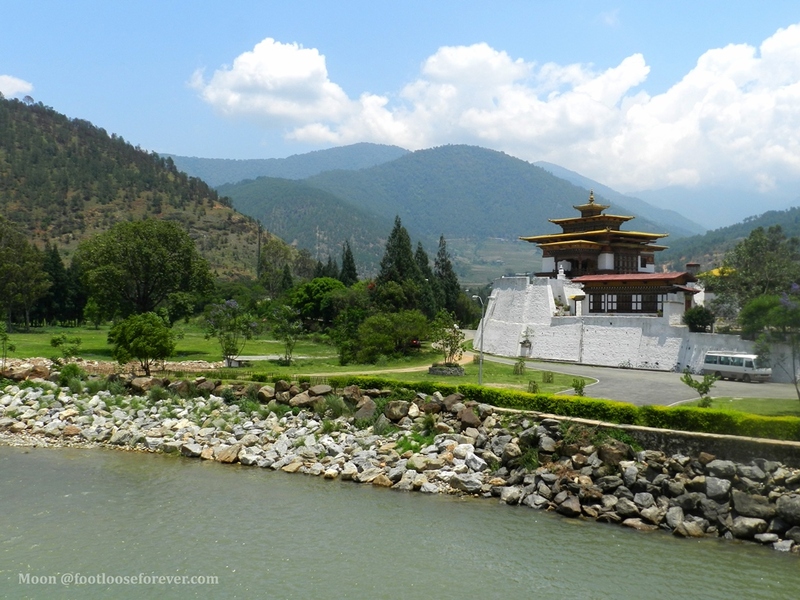 The temple, situated by the holy lake, is one of the oldest temples (2000 years approx.) dedicated to Lord Bramha who is believed to be the creator of this Hindu pilgrimage town. The Vishnu Temple or Rangji Mandir is a unique gem among the cluster of temples in Pushkar. The majestic white temple in ancient South Indian style architecture is sure to impress a traveler at first sight. Sri Panchkund Shiva Temple is located withn a few kilometers from the lake in Pushkar. The legend says the temple was built by the five pandavas from Mahabharata. Savitri Temple, dedicated to Savitri, the wife of Lord Bramha, is located on top of a hill overlooking the holy lake. 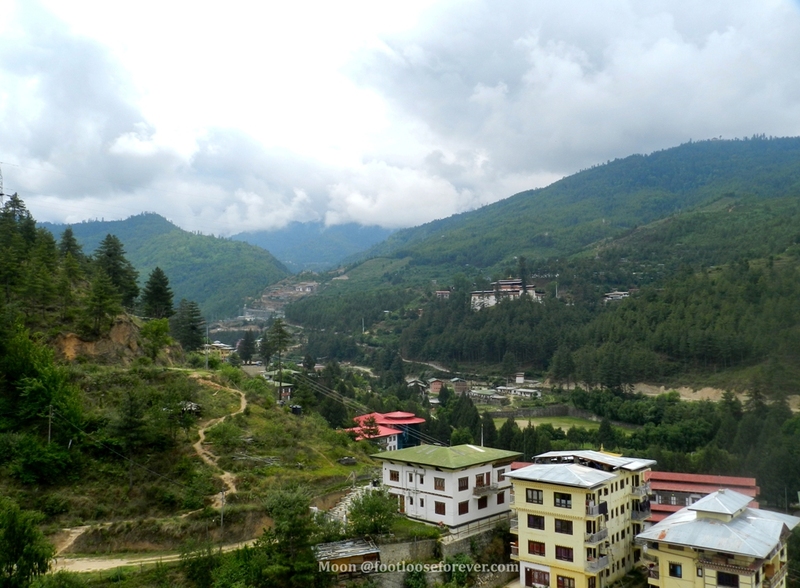 The trek up the hill is toilsome, as you have to climb hundreds of steps. But the end result is quite rewarding. 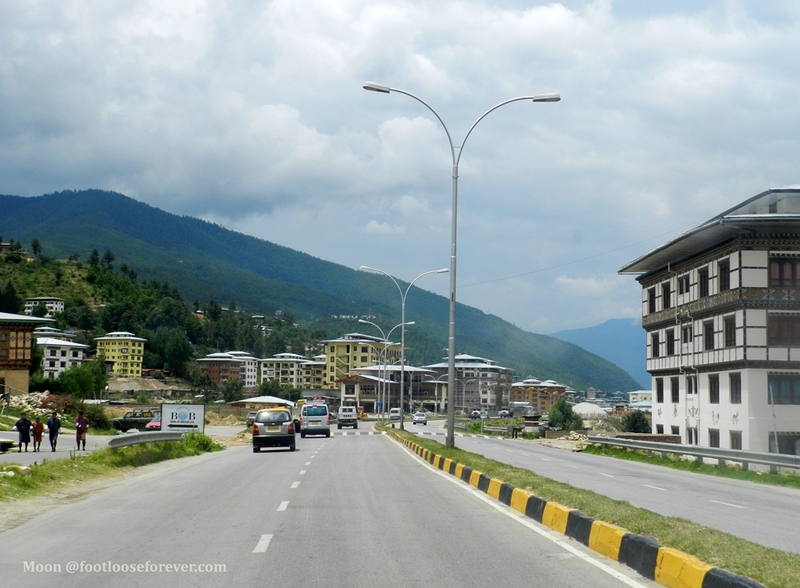 The breathtaking panorama of the town is enough to forget the pain of getting there. Pushkar is an ideal place for shopping Rajasthani items. You can buy colorful handmade tote bags; silk scarves; mirror-worked Rajasthani lehenga (pair of indigenous skirt and blouse), bags and purses; local-made oxidized metal jewellery and trinkets at competitive price. I bought a few bags and purses as souvenirs and a cute little set of lehenga for my little niece. After a walking tour of Pushkar when we came back to the hotel I was a different person. I started my journey to Pushkar as a skeptic with an empty mind and came back a contented soul with a bundle of memories to cherish forever. Pushkar travel taught me to open my heart, to accept things as they come. 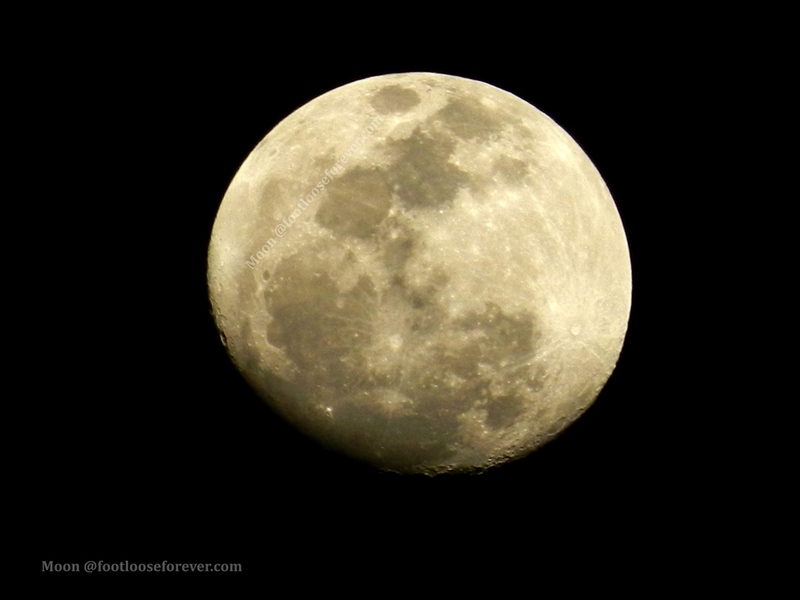 I realized that we travel to find many of our preconceived notions about a place are actually wrong. The next day we were on the road again on the way to Udaipur. Check out more photos of Pushkar in my Flickr album.